Name a state. We’ve been there. 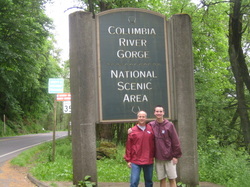 After seeing the Columbia River Gorge in Oregon last week, my son Andrew completed a personal goal to visit all 50 states. It started when Andrew tagged along with me on a quest to visit all 50 state capitals. When I finished five years ago, he realized that with a little creativity, he could reach all 50 states. The easiest place to see states is New England, where they are all bunched together. Drive the same distance from Corinth to Biloxi and go through six states. We knocked that out during spring break of 2009 and even learned something about Starkville’s namesake, General John Stark, while in New Hampshire. We don’t claim to have seen the best parts of every state. We count Delaware because we passed through it on the drive from Baltimore to Philadelphia. We exited on the Montana side of Yellowstone National Park (just barely in Montana), but hope to return to that state to see more. But to see all 50, sometimes you have to go out of your way, which we did in the summer of 2009. We had stopped in the Detroit airport once and I told Andrew, “That doesn’t count.” So we returned to Detroit for a Tigers baseball game and a visit to the Henry Ford Museum (which like Williamsburg is a campus, not a building). Then we flew to Minneapolis to watch the Twins play. From there, we drove to Fargo and attended the North Dakota State Fair. The most memorable part was the lumberjack competition. A few scary things happened along the way. At Yosemite National Park, Andrew needed to use the restroom in the middle of the night. I was asleep in the tent and didn’t want to get up to take him. He thought a bear might be outside. I reluctantly arose, and sure enough a black bear walked right across our path. After bouncing around the country like a pinball, people sometimes ask us which state is our favorite. That’s Mississippi of course. From the harness racing at the Neshoba County Fair to the haunting loneliness at the Ruins of Windsor, our state takes a backseat to none. We also have new places like the B.B. King Museum, which is Smithsonian-caliber. Visiting all these places has certainly been fun and educational. But the real joy of travel is the togetherness. There is no Wii or Nintendo on a trip. And there is no going to a room and shutting the door for privacy. A trip is all about being together, planning together, eating together, doing together. Last week we tried to take a helicopter to see Mount St. Helens in Washington. We had to drive a long way to discover that clouds were too heavy to take the flight. At the visitor center right in front of the mountain, we could only see the base. On the drive back, Andrew said, “We might not have seen the mountain, but it’s fun just riding and talking.” That’s what traveling is all about.